The 164-page Sengoku Basara Series Official Anthology Comic: Gakuen Basara 5 was released on 28th March 2013 for ¥1,029. Like the earlier books in the series it can be purchased from all good import book stores and manga specialists. With the major characters already introduced and several old faces like Hideyoshi, Hanbee, Nagamasa and Musashi returning to the cast, this is the most crowded volume of Gakuen Basara yet! The cover illustration by artist Nari wraps around to fit as many characters as possible on the front and back of the book. Inside is the textless version of the cover as well as a pair of new colour illustrations by Yukihiro Utako and Kyuugou, plus the usual manga chapters from the regular GakuBasa contributors and a few more 'report cards' to show how each characters fares in lessons. There's a proper theme this time as each story covers a different aspect of a typical Japanese school sports festival (undoukai). It's the evening before the Gakuen Basara sports festival and team leaders are giving their classes pep talks to prepare for victory. Some of the students are noticeably better at fostering a sense of team spirit than others, and several of the groups just end up arguing or getting into trouble. I found this introductory chapter very helpful as it shows how the classes are split up; the artists have taken the opportunity to separate rivals and servants into different groups to force characters to interact with people they normally wouldn't. Even though this information is included in the character roster at the start of the book, it never seemed important in the earlier volumes. The sports festival begins with a three-legged race. Some of the pairings seem poorly chosen: Ranmaru and Sourin cannot work together at all, and Kanetsugu's delusional personality was already driving Kasuga crazy in the previous chapter. Thanks to some cheating by the more tactically-minded participants, the race ends up full of surprises and upsets. The classes compete to see who can cheer the most enthusiastically. Each has various strategies prepared to make their team's cheering routine stand out from the crowd, but some people get more pleasure out of disrupting the other teams than playing fair. Although the disastrous attempt at a 'bonds'-themed cheer by Ieyasu's class made me laugh most, Keiji's team was probably my favourite. The title is a pun on karimono kyousou, a traditional game played at sports festivals where participants draw a card with a clue on it and have to scavenge for something which matches. And that's exactly what this story is about. Kotarou, Kanbee and Mitsunari rush around the school grounds in a desperate struggle to retrieve the difficult items they've been asked to find under the watchful eyes of Nobunaga and Hisahide. This time the title refers to tamaire, a Japanese team game played by quickly throwing lots of balls into a basket. All rules are forgotten as the characters scramble to use every skill at their disposal to win the game; with so many unfair abilities available to the contestants it's impossible to tell which team will prevail. The rarely-seen teachers all gather together for a race while their students cheer them on from the sidelines. Even Nobunaga seems to want to win! It turns out that most of the teachers are happy to bend the rules as much as anyone else - though having played the games I think Kenshin must have been running slowly on purpose to give everyone else a chance. Oodama korogashi (or tamakorogashi) is a Japanese relay race where participants roll a large ball as they run. The other teams conspire against Tadakatsu's overwhelming strength, coming up with an elaborate plan to take him out of the game entirely so the rest of them can have a 'fair' match. Can four warring classrooms really unite to carry out such treachery successfully? Yet another play on a normal sports festival event. This time, bell-splitting (suzuwari) is replaced by balloon-splitting. 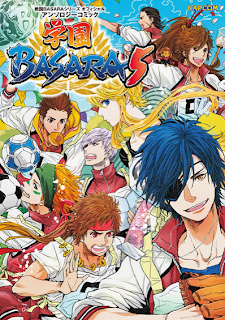 The Gakuen Basara version is more like a mock cavalry battle (kibasen); each student has a small balloon strapped to their head and a squeaky hammer, and the goal is to burst all of the opposing team's balloons with the hammer while protecting your own. With the Gakuen Basara characters all using their signature fighting techniques, the school's playing field becomes a battlefield! It's time for the final event of the sports festival, and the school's leaders have declared that it will be the decider by making it worth far more points than any of the earlier competitions! They didn't have much choice - it was probably impossible to calculate the scores after so many of the earlier events ended in disqualification. Masamune, Yukimura, Mitsunari, Hideyoshi and Keiji take the lead roles in a no-holds-barred rush for the finish line! Sanorin, Yanagi Batoshirou, Arai Karo have participated in every Gakuen Basara book to date, while Rokuji, Maki, Minami Seira, Mikami and Danbo all from the 'second generation' of regular GakuBasa participants who started in the third volume. Matsuura Hako returns for the first time since Gakuen Basara 2 and Yonata is a complete newcomer. In spite of the silly storyline Gakuen Basara 5 is another strong book in the series, packed full of treats for long term fans. For me, the highlight was seeing Nagamasa back together with Oichi; she's still her gloomy self but they're dreadfully cute as a pair. It was also hilarious having Hideyoshi, Hanbee and Mitsunari separated across three different teams. The level of passion that the members of the Toyotomi faction have for their leader never stops being funny. The shuffling of the established character relationships to force allies to battle one another was a great way to keep the typical sports festival formula from getting stale. I love the usual Sengoku Basara teams as much as anyone, but everything is so much more vibrant when enemies have to come together to challenge their closest friends, and when the characters are forced to choose between staying loyal to their friends or supporting their classmates. The artists have made full use of the comedy potential on offer to make this one of the strongest volumes in the Gakuen Basara series to date.